The Brazilian ship ITAPUI in Tilbury . She was built in 1971 with a 10,848grt. I have no more details RWJ. 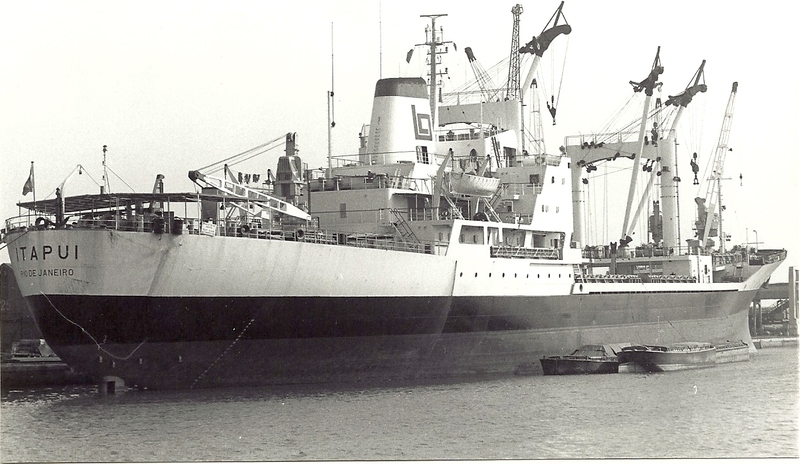 The ITAPUI was one of a series of sisterships completed in the late 1960s and early ’70s for the Brazilian state-owned shipping company Lloyd Brasileiro. Most of these ships were visitors to Tilbury docks. At 12,222 tons deadweight and with a particularly high service speed of 20 knots, ITAPUI and her sisters came along at a time when the Brazilian government was seeking to privatise the company. The privatisation plan was repeated half-a-dozen times over the next few years, but it came to nothing. ITAPUI was built at a shipyard in Brazil that was jointly owned by the Dutch company Verolme and the Brazilian government, and this and many other ships that were built in the country suffered from slow construction times. But that was not the main problem for Lloyd Brasileiro, which continued to built new ships right up to 1986. The problem was a mixture of erratic freight rates and a degree of poor management. Added to this, promised government subsidies went pearshaped and by the end of the 1980s, when ITAPUI and her sisterships were scrapped after a relatively short lifespan, the writing was on the wall for Lloyd Brasileiro. 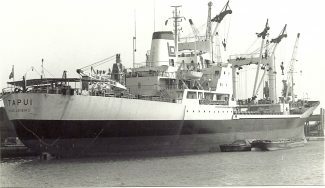 The company was formally dissolved in 1997, three years after it had “celebrated” its centenary, but into the ’90s its ships were being rapidly sold off.